If ever there was a nightmare start to a Premier League fixture, then Fulham certainly experienced it here against Watford. Going a goal down within 90 seconds whilst barely having a touch of the ball, it was essentially like the hosts started with a one-goal handicap. Amidst the pouring rain, it felt like it could well be one of those afternoons in SW6. But knowing when to change tact and being able to realise weaknesses is undoubtedly a strength. Slavisa Jokanovic showed those qualities with his half-time changes – abandoning the aim of winning a midfield battle that was never a contest to being more direct and using the pace of his wingers. A renewed aggression as a result of the adjustments saw the hosts valiantly fight for a share of the points. Coming up against an in-form Watford side, was never going to be an easy task. In the end, Fulham could have won it; finishing the match brightly and forcing Ben Foster into aerobic acrobatics, it was clear that Jokanovic’s men do not do pragmatism despite having the worst defensive record in the league so far. If Fulham are to survive this season then following their approach in the second-half will most definitely be the way to do it. Full-backs Timothy Fosu-Mensah and Ryan Sessegnon offered plenty of encouragement to both Fulham and England supporters. “I am not disappointed with the result,” Watford head coach Javi Gracia said post-match. “I am happy with the work we have done today.” Having 13 points from their opening six matches is certainly something to be proud of, but given their surging start and peppering of the Fulham goal in the opening half-hour, it really should have been 15 points. Both sides were coming off the back of defeats last weekend – coincidently against both Manchester clubs – but it was Watford that started the better. 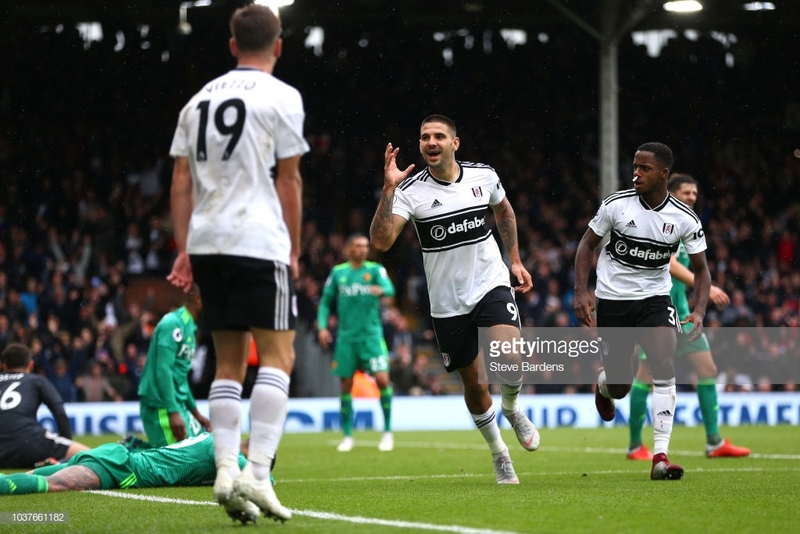 In almost a continuation from their victory over Tottenham before the international break, they matched the rain and poured into the Fulham penalty area. Frail defending allowed Will Hughes to find Andre Gray who slotted the ball into the net with only 87 seconds on the clock. Jokanovic’s reintroduction of Calum Chambers gave rise to uncertainty around the Fulham area and was ultimately costly so early on. Watford were in full flow and it was easy to see why they have been up at the top of the table during the early stages of this season. The Fulham defenders consistently managed to present Watford with repeated chances to extend their lead. Jean Michael Seri and Kevin McDonald did little in midfield to offer any resistance, if it wasn’t for goalkeeper Marcus Bettinelli then the scoreline could have been more emphatic at the break. Half-time gave Jokanovic opportunity to regroup and rethink, although Watford’s attacking presence had died down a little towards the end of the half, Fulham had struggled to even do the basics right, i.e. keep possession. Two of his starting XI, Alfie Mawson and McDonald, were given the hook, as Denis Odoi and Floyd Ayite were introduced. Jokanovic admitted that he would have made four changes if he were able to. In the first-half, there were simply too many passengers for Fulham. Despite the money spent in the transfer window – and the quality that is evident after an inspection of the team-sheet – not enough players were making the stamp on the match; every loose ball was collected by a player in green. It was lacklustre to say the least, frustrating for the home fans. The second-half changes brought an impetus. Odoi and Ayite excelled and Seri was at last able to exert midfield influence, especially after the 64th-minute introduction of Andre-Frank Zambo Anguissa. Meanwhile, Andre Schurrle, Fulham’s main attacking threat in the first half, presented constant problems for Watford’s defenders. But it was Aleksandr Mitrovic who provided the crucial touch as far as the home side were concerned. He is a striker with brawn and power but still yet to fully convince as a consistent top-flight goalscorer. He was a presence and saw his fair share of chances but up until the 78th-minute, he had been wasteful – the hosts racking up 12 attempts off target. Schurrle was key in the equaliser, as was Luciano Vietto who seemed to only appear for the second-half. He provided the key runs in and around the Watford defence that freed-up Mitrovic. The Serbian striker bundled the ball home to send the home crowd wild. On their second-half showing it was what they deserved. “They showed a different level,” Jokanovic said of his team – from the first-half to the second- that was certainly true.